The imperfections in these images do not represent normal wear and tear. Uneven, chipped, cracked, or stained teeth are warning signs of potential problems related to your bite. 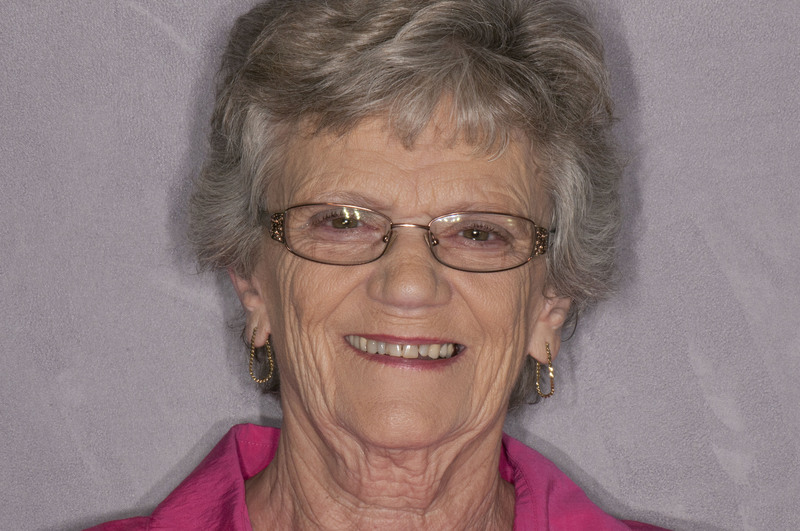 If you see similar issues with your smile, please schedule a visit with Dr. Huffstutler today. 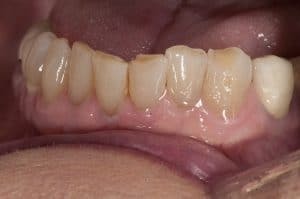 We will perform a bite evaluation to identify common problems, such as teeth grinding or TMJ disorder. 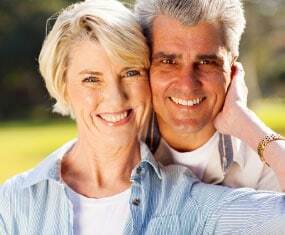 We can use conservative and innovative treatment options to restore the beauty, health, and function of your teeth. You can once again enjoy a whole and healthy smile. 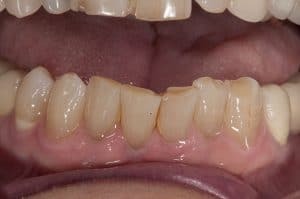 Sleeping grinding, also referred to as bruxism, is a common but serious dental health issue. People who frequently grind their teeth during sleep may eventually wear them down or develop fractures or chips. In the photographs below we see examples of severe damage from sleep grinding. 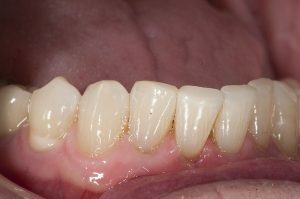 The first image shows grinding wearing down the teeth. 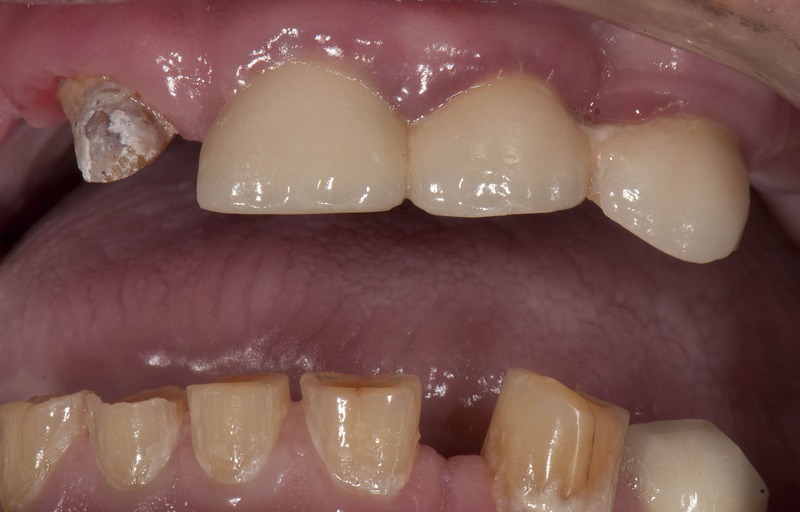 The second image shows the loss of a dental bridge due to chronic sleep grinding. Fortunately, we have skills and knowledge to correct damage caused by bruxism. 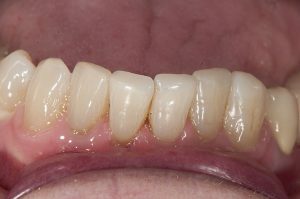 The final image shows veneer placement that restores function during the transitional treatment period. This patient is a severe sleep grinder. 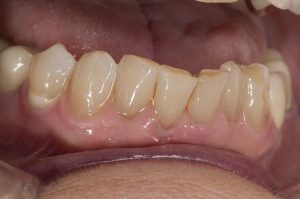 The patient elected to treat this with bite balancing, 2 ceramic veneers and 2 resin veneers. Very natural outcome! 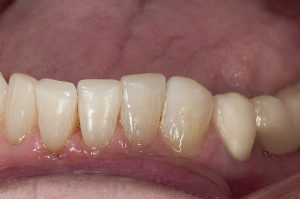 this patient has not had comprehensive treatment, but only treatment of the four upper incisors. See what your smile can look and feel like after a customized treatment plan with Dr. Huffstutler. To reserve your consultation, click the banner below, or call our office in Ft. Worth, TX, today at (817) 577-1444. Our office welcomes patients from all over DFW, including Dallas, North Richland Hills, Denton, the Mid-cities, Southlake, and all surrounding communities.